Spring for the Green, the Trees Columbus annual membership party and fundraiser, celebrates Earth Day and the end of a successful planting season each year. This year, we also celebrate 18 years of Trees Columbus and the planting of our 14,000th tree! Join us for Bluegrass music, Country’s Barbecue, and beer and wine on the grounds of the beautiful Spencer Environmental Center. Bring the family. A fenced yard provides safe and family-friendly fun for all ages. 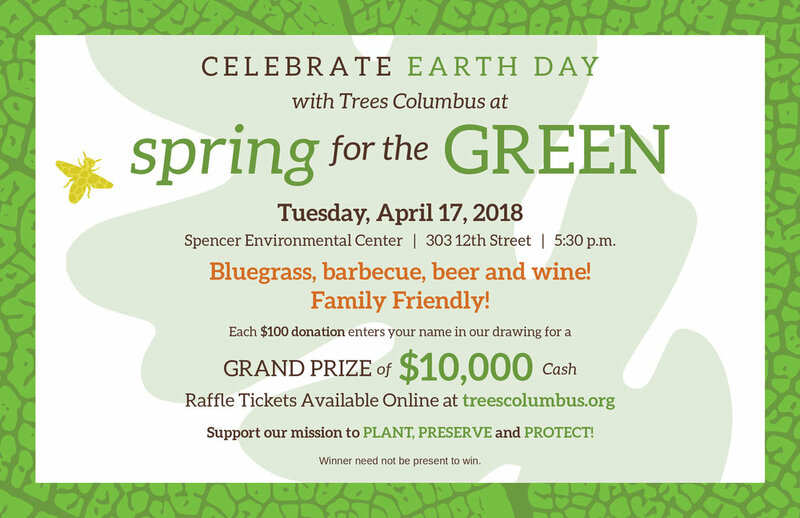 Don’t forget to purchase your raffle ticket in support of Trees Columbus. Grand Prize is $10,000 cash. We are celebrating 18 years and 14,000 trees thanks to the generosity of our members and supporters!